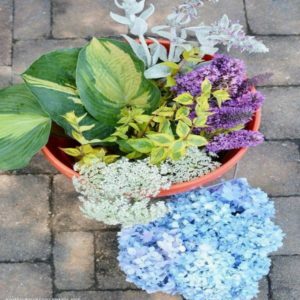 Mary from Charlotte, NC shared us an easy way to make a garden flower arrangement. She put together a quick arrangement with flowers and greenery from the garden and shared some flower arranging tips. She gathered some blooms and greenery in the morning. It is important to cut the flowers and greenery in the morning when the stems are fully hydrated and not water-stressed from the heat.